In this talk, delivered at the 2017 Convention of the National American Interfaith Network in San Diego, California, Rev. David Fekete addresses the issue of Ecumenism, Pluralism, and a Swedenborgian view of growth through diversity in an inter-religious context. Rev. David Fekete, PhD, is pastor at the Church of the Holy City (Swedenborgian) in Edmonton, Alberta, and senior editor of “Our Daily Bread” at spiritualquesters.org. 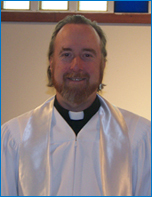 His passions include literature, ecumenism, music and the arts, as well as interfaith dialogue.